The cassius blue, Leptotes cassius (Cramer), is a beautiful tiny butterfly that is locally common throughout peninsular Florida — particularly along the coasts. It is sometimes known as the tropical striped blue (Scott 1986). There are two subspecies in the United States, theonus in Florida and striata in Texas. Blues in the genus Leptotes are collectively known as the "zebra blues" (Brower 2008) because of the characteristic dark stripes on the under surface of the wings. Figure 1. Dorsal view of the wings of an adult female cassius blue, Leptotes cassius (Cramer). Photograph by Jerry F. Butler, University of Florida. The cassius blue, Leptotes cassius theonus, is resident in southern peninsular Florida but occasionally strays to more northern areas. It is cold sensitive and cannot survive even the winters of northern Florida. The mechanism by which individuals arrive at more northern localities is not known. Perhaps some are carried by wind. 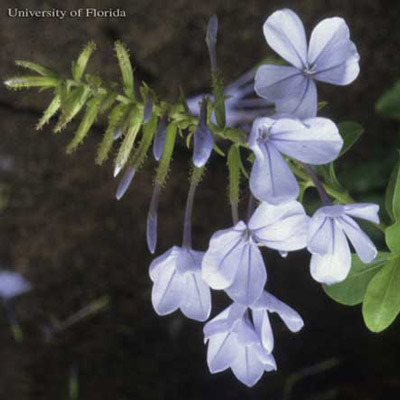 Daniels (2005) found larvae on ornamental leadwort plants in South Carolina that had been shipped from Florida and suggested that piggybacking on ornamental host plants may account for the some of the northern strays. Adults: The average wing spread is approximately 3/4-15/16 inches (20-33 mm) (Opler and Malikul 1992). The undersides of the wings are striped with two eyespots on the margin of each hind wing. Males are pale to bright blue above. 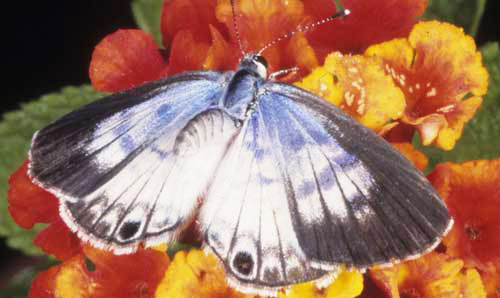 Females are bluish-white to white above on basal areas of wings with broad dark borders on the front wings and a dark spot on the rear margin of the hindwing (Cech and Tudor 2005, Minno and Minno 1999). Figure 2. Ventral view of the wings of an adult female cassius blue, Leptotes cassius (Cramer). 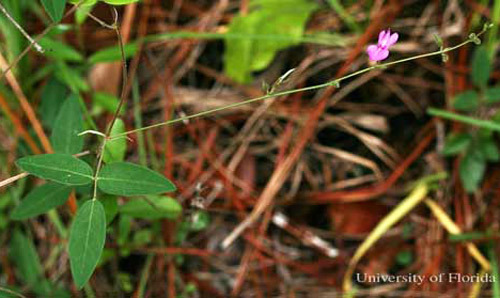 Photograph by Jerry F. Butler, University of Florida. Eggs: The eggs are whitish-green and the surface is sculptured with a network of knobs and ridges. Figure 3. 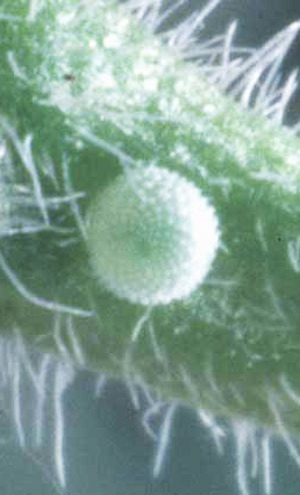 Egg of the cassius blue, Leptotes cassius (Cramer). (Collected by Marc Minno). Photograph by Jerry F. Butler, University of Florida. Larvae: Full grown larvae are approximately 0.5 inch in length (Minno et al. 2005). Body color is green with faint dark markings or patterned with faint white markings (formed by numerous tiny white hair-bearing tubercles [chalazae]) or red markings and white chevrons. Figure 4. Larva of the cassius blue, Leptotes cassius (Cramer). Photograph by Jerry F. Butler, University of Florida. Pupae: The pupae are tan with dark markings and numerous short white hairs. Figure 5. Pupa of the cassius blue, Leptotes cassius (Cramer). Photograph by Jerry F. Butler, University of Florida. The cassius blue is found throughout the year in Florida and has at least three generations per year (Glassberg et al., Minno et al. 2005). 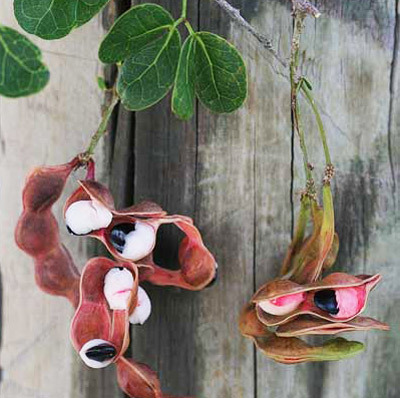 The eggs are laid singly on the flower buds of the host plants and larvae eat the buds, flowers, and developing seeds (Minno and Minno 1999, Minno et al. 2005). 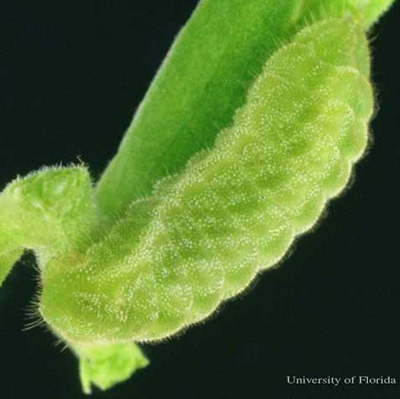 There are four larval instars in Florida (Downey and Allyn 1979). The larvae are well-camouflaged and may be attended by ants for which they provide sugary secretions from a honey gland on the dorsal surface of the seventh abdominal segment (Downey and Allyn 1979, Opler et al. 2009). 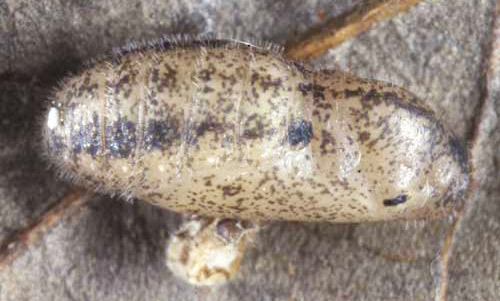 As is the case with most lycaenids, pupae stridulate with a scraper and file in the dorsal cleft between the fifth and sixth abdominal segments (Downey and Allyn 1979). The stridulation is assumed to serve a defensive purpose. Downey and Allyn (1979) found a braconid wasp in the genus Pelecystoma parasitizing larvae, and the tachinid fly Eusisyropa boarmiae [Coq.] parasitizing pupae. In a collection of eggs from early June, they found 17% parasitized by the generalist egg parasite Trichogramma minutum Riley. Adults feed on nectar from a wide variety of flowers. Figure 6. Downy milkpea, Galactia volubilis [L.] Britton, a host of the cassius blue, Leptotes cassius (Cramer). Photograph by Donald W. Hall, University of Florida. Figure 7. Florida hammock milkpea, Galactia striata [Jacq.] Urb., a host of the cassius blue, Leptotes cassius (Cramer). Photograph by Donald W. Hall, University of Florida. Figure 8. Florida Keys blackbead, Pithecellobium keyense Britton ex Britton & Rose, a host of the cassius blue, Leptotes cassius (Cramer). Inset is of new growth showing arrangement of leaves. Photograph by Donald W. Hall, University of Florida. Figure 9. Catclaw blackbead, Pithecellobium unguis-cati [L.] Mart., a host of the cassius blue, Leptotes cassius (Cramer). Photograph by Donald W. Hall, University of Florida. hairy cowpea, Vigna luteola [Jacq.] Benth. false tamarind, Lysiloma latisiliquum [L.]Benth. Figure 10. 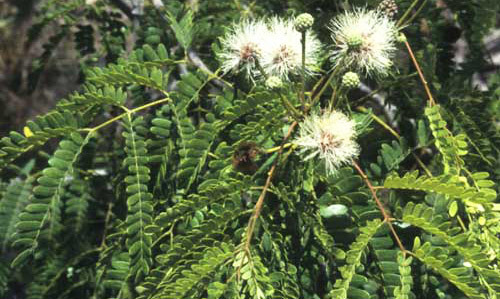 False tamarind, Lysiloma latisiliquum [L.]Benth., a host of the cassius blue, Leptotes cassius (Cramer). Photograph by Donald W. Hall, University of Florida. 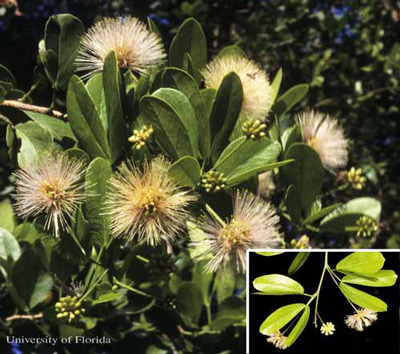 Florida fishpoison tree or Jamaican dogwood, Piscidia piscipula [L.] Sarg. 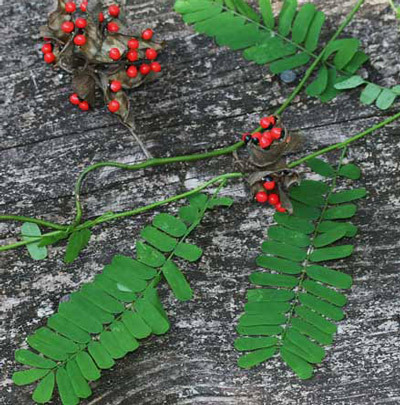 and the exotic rosarypea, Abrus precatorius L. Rosarypea, also known by many other common names, is invasive and disruptive to native plant communities (FLEPPC 2007), and its seed is extremely poisonous (INCHEM undated). Therefore, it should never be planted. Figure 11. Rosarypea, Abrus precatorius L., a host of the cassius blue, Leptotes cassius (Cramer). Photograph by Donald W. Hall, University of Florida. One of the most common larval hosts is the widely-planted exotic ornamental cape leadwort (Plumbago auriculata Lam.) in the leadwort family (Plumbaginaceae). Figure 12. Cape leadwort, Plumbago auriculata Lam., a host of the cassius blue, Leptotes cassius (Cramer). Photograph by Donald W. Hall, University of Florida. Doctorbush (Plumbago scandens L.), a native leadwort species, is also used (Minno and Minno 1999). Daniels JC. 2005. Piggybacking northward: movement of Leptotes cassius (Lycaenidae: Lycaeninae) throughout the Southeast. Journal of the Lepidopterists' Society 59: 234. Downey JC, Allyn AC. 1979. 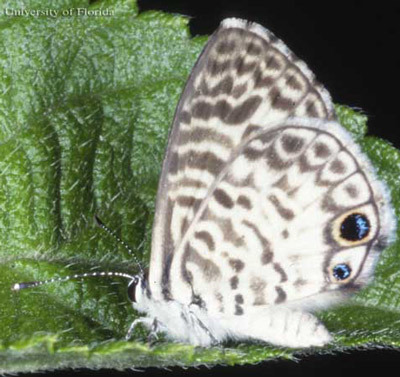 Morphology and biology of the immature stages of Leptotes cassius theonus (Lepidoptera: Lycaenidae). Bulletin of the Allyn Museum 55: 1-27. FLEPPC. 2007. 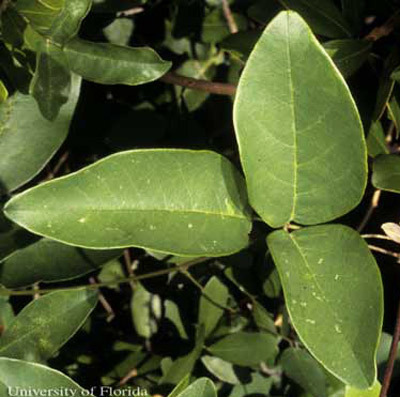 List of Florida's Invasive Plant Species. Florida Exotic Pest Plant Council. Wildland Weeds Vol. 10(4), Fall 2007. Miller JY. (editor). 1992. The Common Names of North American Butterflies. Smithsonian Institution Press. Washington, D.C. 177 pp. Minno MC, Minno, M. 1999. Florida Butterfly Gardening: A Complete Guide to Attracting, Identifying, and Enjoying Butterflies. University Press of Florida. Gainesville, Florida. 210 pp. Opler PA, Malikul V. 1992. A Field Guide to Eastern Butterflies (Peterson Field Guide Series). Houghton Mifflin Company. New York, N.Y. 486 pp. Publication Date: June 2009. Latest Revision: August 2016.